Dr. Nawrocki is a general and cosmetic dentist in Orange Park, FL. He is also a trained prosthodontist, which is a dental specialty requiring extensive education and training on the esthetic restoration and replacement of teeth, making Dr. Nawrocki one of the leading cosmetic dentists in Orange Park, FL and the surrounding areas. Are you happy with your smile? Do you have crooked, misshapen, or discolored teeth? 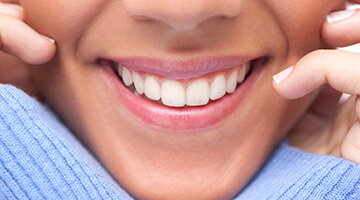 Do you actively think about your teeth when you smile or speak? If so, you could benefit from our cosmetic dentistry services. Cosmetic dentistry refers to any dental treatment that is designed to improve the esthetics of your smile. Below is a list of some of the cosmetic dentistry options available. For more indepth information, feel free to view the our services section or contact us any time. Do you want a brighter smile? Do you have unsightly gaps, discolorations, cracks, or chips in teeth? If so, veneers could be a terrific option to obtain that esthetically healthy and beautiful smile you would love to have. Orange Park general dentist and prosthodontist, Matthew Nawrocki DMD, MS, is proud to offer veneers and other cosmetic dentistry options to the residents of Orange Park and the surrounding communities. Veneers are one treatment cosmetic dentists use to correct the shapes of teeth utilizing a thin porcelain shell. When properly bonded to the tooth, these shells are strong and beautiful. These are often the treatment of choice for minor positional alterations and the correction of tooth shapes, colors, and sizes. They are often a great form of treatment for teeth that are resistant to whitening procedures. One overarching goal in dentistry is to preserve the natural tooth structure. Veneers can be a benefit over crowns and other restorative options. Although the treated tooth requires a slight reduction, it is much less aggressive procedure. Veneers are often a two visit procedure. After careful consideration and a mutual agreement between you and the dentist, a small amount of tooth structure will be reduced. The dentist will take impressions and send them to the lab for the custom fabrication of the veneers. During this time, the dentist will provide the patient with temporary veneers. The result can be what generally is seen as the “Hollywood” smile. Veneers will be cared for just like the healthy, natural teeth. Brushing, flossing, a proper diet, and overall good oral hygiene will preserve the veneers for as long as possible. Unlike natural teeth, the veneers do resist stains from tobacco as well as staining drinks like coffee and juice. If you have sustained damage or have a decayed tooth in the front of your smile, you require a blend of cosmetic and restorative dentistry. Metal-free restorations take care of both. These sturdy crowns, bridges, inlays, or onlays are constructed out of porcelain or ceramic, a material that is highly customizable to match the shade of your surrounding tooth enamel. Metal-free restorations are completed over the course of two visits to Dr. Nawrocki’s office. Chipped, decayed, unevenly spaced, or misshapen teeth can be corrected by bonding. 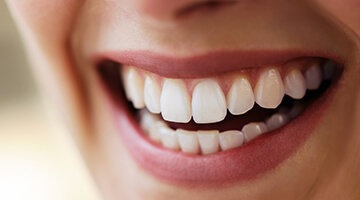 Bonding is the utilization of a tooth colored resin material that is placed into the prescribed area of the tooth and light cured to bond to the tooth. The result is a healthy, natural looking tooth. 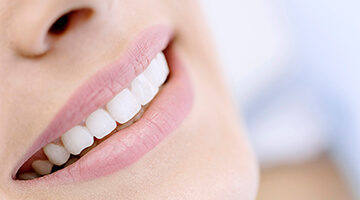 Bonding has the advantage of being one of the more economical cosmetic dental procedures because, unlike many of the other cosmetic services, this can be done in one appointment. In addition, it is generally a more conservative approach than other cosmetic dentistry options, removing less tooth structure than some of the other procedures. Looking for a way to get a straighter smile without metal brackets and wires? Dr. Nawrocki is happy to offer a clear alternative - Invisalign clear braces. 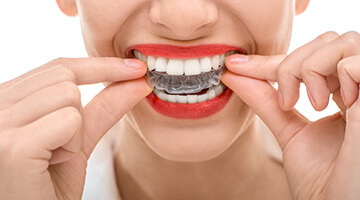 This alignment tray orthodontic system allows us to correct even severe bite alignment concerns, like over, under, or crossbite, without unsightly, uncomfortable metal braces. With fewer checkup appointments necessary during treatment and only about twelve months to perfect smile alignment, Invisalign is the faster and more convenient orthodontic solution. Tooth discoloration happens to nearly everyone. This can happen naturally and gradually, or can be attributed to environmental factors like tobacco, certain drinks, or antibiotics during development. Each of us has different tooth anatomy and some are more susceptible to tooth discoloration than others. The good news is that most tooth staining can be arrested and reversed by tooth whitening. Many of the over the counter products available have little or no efficacy. By contrast, a cosmetic dentist can fashion custom whitening trays and prescription whitening solution to deliver excellent results.